Or, the Bambi Bumblers visit my lawn. My neighborhood is loaded with wildlife - deer, foxes, owls, woodpeckers, the occasional coyote. I get a kick out of seeing and listening to them. The deer are omnipresent, and sometimes they scare the crap out of me just because they are damn quiet and appear out of nowhere. More than once, I've walked out of my building smack dab into a deer standing on the front steps. There's usually a shared deer-in-headlights moment as we stare at each other as if to say, "Damn! Don't sneak up on me like that!" Today, coming home from the grocery store, there was a small herd of young deer at my doorstep - two male yearlings with short horns and four fawns. No mothers anywhere in sight. It's odd to see so many young ones with no adult supervision. Just as I pulled up, an elderly couple taking an afternoon stroll approached from the other direction. The deer panicked and started bolting in all directions. It was as if they'd lost all control - two fawns flew across the street in huge graceful leaps and vanished into the woods. The remaining two fawns and the yearlings, however, proceeded to engage in a completely graceless Keystone Kops routine, smacking into each other, leaving one yearling on his back, flailing on the sidewalk and one fawn in kicking distance. That fawn ended up getting smacked in the head and knocked off his feet, on top of the yearling. This lead to much rolling, kicking, and general angst, as the other two just watched, as if amazed by their compadres utter lack of coordination. The yearling finally did an exaggerated head shake, got to his feet and bolted into the woods, the other fawn and yearling in tow. The remaining fawn just lay on the lawn like an enormous furry slug until his senses returned to him. 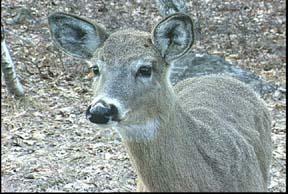 (Meanwhile, the elderly couple is frozen in their tracks, and I'm just standing at the back of my car, waiting for DeerFest '05 to end, so I can unload my groceries without getting kicked in the head by a stressed out woodland creature.) At last, the little guy got up, swayed on his feet for a few seconds, and then headed for the trees at a drunken trot. Interestingly, none of them made a single sound throughout this whole event. Not a snort. Not a shriek. Nada. In fact, it was all so silent, had I not seen it, I wouldn't have known it happened. I laughed pretty dang hard at this en-deering story. There is a lesson to be learned herein from those klutzy critters, if you are going to totally screw up... do it silently. heehee. baby deers are so ungangly. not at all the graceful creatures they are as adults. but how freaky to have them right outside your door.